This recipe comes straight out of Heidi Swanson’s fabulous 2011 cookbook, super natural every day from Ten Speed Press. 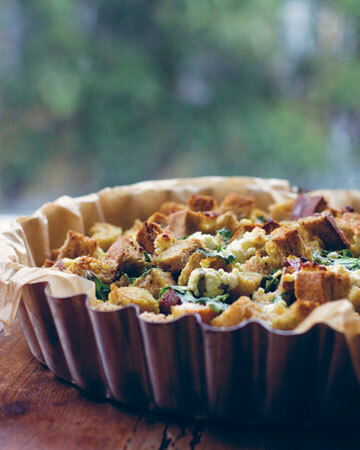 Heidi is a California-based cookbook author, photographer, website publisher, and shop curator. She is also a New York Times bestselling writer, and winner of a 2002 James Bear Award for this cookbook. Could it get any better for this woman? Way to go, Heidi! The cookbook, a birthday gift to me from our sweet daughter, Sarah and her husband Travis is the only cookbook I’ve ever read straight through from cover to cover—and one of my favorite ‘go-to’ volumes. And I have a lot of cookbooks! And, as if that’s not enough, I follow her blog at http://www.101cookbooks.com/index.html. You can too! Check it out! Enjoy this on a cool, crisp morning with friends! Rub a splash of olive oil in a 9-inch square baking dish (or equivalent). Alternatively, line the pan with parchment paper. Sprinkle the baking dish or parchment paper with lemon zest and set aside. In a medium bowl, whisk the olive oil, mustard, salt, and pepper with a splash of the milk. Whisk in the rest of the milk and the eggs. Put the bread in a large bowl and add the spinach and half of the feta. Gently toss with your hands—just enough that the spinach and cheese mixes with all those pieces of bread, then transfer to the prepared baking dish (you can also do the mixing directly in the baking dish if it is large enough) making sure the bread is relatively level in the baking dish. Very slowly drizzle the egg mixture over the bread and sprinkle the remaining feta over the top. Cover and refrigerate overnight. Bake the strata, uncovered, on a rack in the top third of a preheated 350 degree oven for 45 to 55 minutes, until the egg is set in the middle and the edges are browned. You can brown the top a bit more under the broiler if you like, if you have not used the parchment paper. Serve warm, drizzled with a bit of olive oil and sprinkled with the fresh oregano.